Does the IMF come from the CMF? 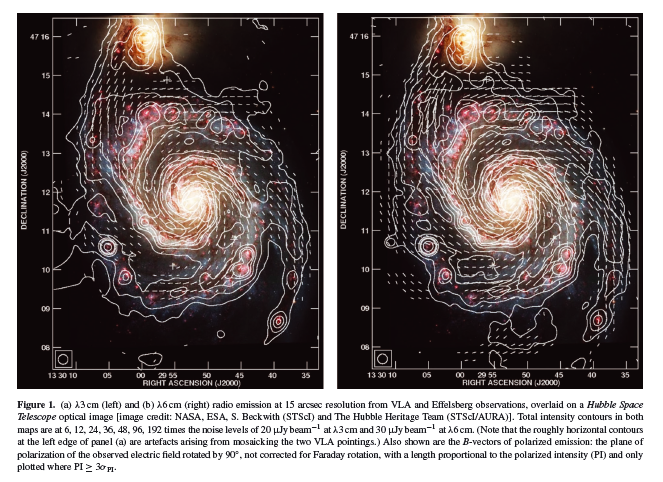 We use new multiwavelength radio observations, made with the VLA and Effelsberg telescopes, to study the magnetic field of the nearby galaxy M51 on scales from 200 pc to several kpc. Interferometric and single-dish data are combined to obtain new maps at λλ3, 6 cm in total and polarized emission, and earlier λ20 cm data are reduced. We compare the spatial distribution of the radio emission with observations of the neutral gas, derive radio spectral index and Faraday depolarization maps, and model the large-scale variation in Faraday rotation in order to deduce the structure of the regular magnetic field. We find that the λ20 cm emission from the disc is severely depolarized and that a dominating fraction of the observed polarized emission at λ6 cm must be due to anisotropic small-scale magnetic fields. Taking this into account, we derive two components for the regular magnetic field in this galaxy; the disc is dominated by a combination of azimuthal modes, m = 0, 2, but in the halo only an m = 1 mode is required to fit the observations. 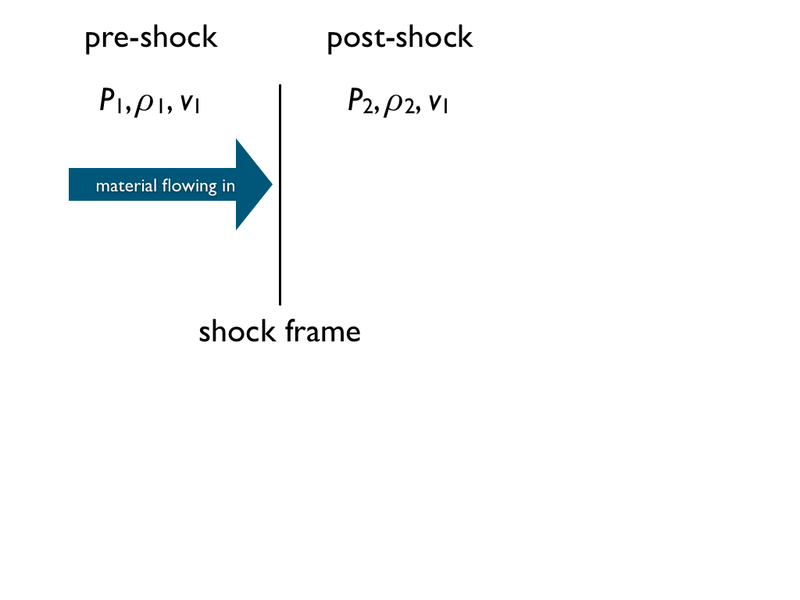 We discuss how the observed arm–interarm contrast in radio intensities can be reconciled with evidence for strong gas compression in the spiral shocks. In the inner spiral arms, the strong arm–interarm contrasts in total and polarized radio emission are roughly consistent with expectations from shock compression of the regular and turbulent components of the magnetic field. However, the average arm-interam contrast, representative of the radii r > 2 kpc where the spiral arms are broader, is not compatible with straightforward compression: lower arm–interarm contrasts than expected may be due to resolution effects and decompression of the magnetic field as it leaves the arms. We suggest a simple method to estimate the turbulent scale in the magneto-ionic medium from the dependence of the standard deviation of the observed Faraday rotation measure on resolution. We thus obtain an estimate of 50 pc for the size of the turbulent eddies. M51, the whirlpool galaxy is a spiral galaxy, which is 23+-4Mly away from us. It was the first external galaxy where polarized radio emission was detected and one of the few external galaxies where optical polarization has been studied. The authors fit the polarization angles using a superposition of azimuthal magnetic field modes. They noticed the difference in the dominate modes in the disk and the halo of M51. The authors calculated the arm and interarm contrast in B field, and gave an explanation to the long standing arm and inter-arm contrast problem. 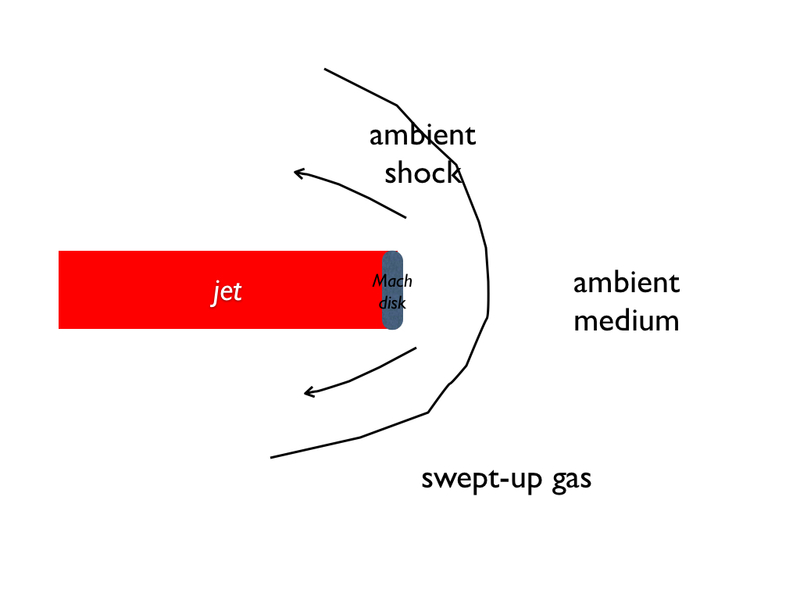 The authors compared the arm inter-arm contracts of gas with magnetic fields, and discussed for the first time the interaction of the magnetic fields with the shock fronts in detail. The polarization of the light is obtained using the stoke parameters (covered in Ay150). Faraday depolarization is caused by Faraday dispersion due to turbulent magnetic fields. The authors introduce a new method to estimate the size of the turbulence cell using Faraday depolarization. The Rotation measure dispersion within a beam of a linear diameter D is related to the dispersion within a cell by: , where d is the size of the cell and D is the diameter. Because the internal Faraday dispersion within a cell is determined by turbulence in the magneto-ionic interstellar medium, the dispersion within a cell can be determined as the following: , where Br is the strength of the component of the random field along the line of sight, L is the total path-length through the ionized gas (see details in Burn 1966; Sokoloff et al. 1998). 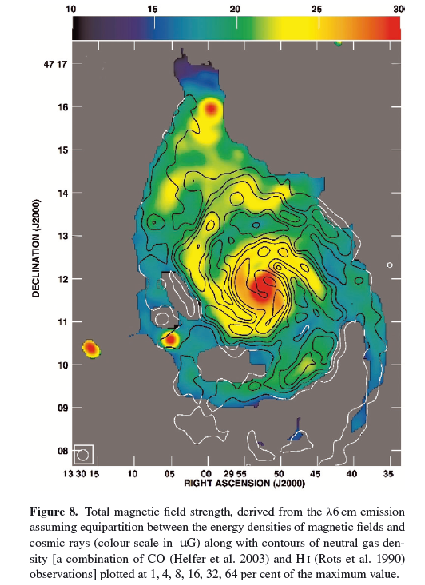 The authors estimated the turbulent cell to be 50pc. 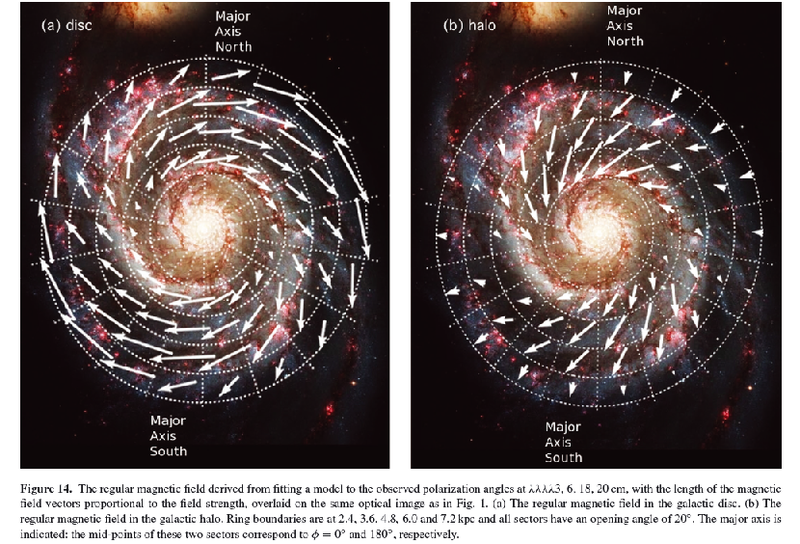 Fit the polarization angles using a superposition of azimuthal magnetic field modes exp(imf) with integer m, where f is the azimuthal angle in the galaxy’s plane measured anticlockwise from the north end of the major axis. The authors found that in the disc, the field can be described as a combination of m=0, 2 and in the halo, the field can be described as m=1. The origin of the halo field is unclear. Arm-interarm contrast in the strength of B field is a long-standing problem. 1970: Roberts and Yuan suggested that magnetic field increase in proportion to the gas density at the spiral shock. 1988: Tilanus et al. noticed that from observation, synchrotron emitting interstellar medium is not compressed by shocks. 1974 and 2009: Mouschovias et al. (1974), and Mouschovias et al. (2009) suggested that only a moderate increase in synchrotron emission is expected due to the Parker instability (instability caused by the magnetic fields and the cosmic ray), so the magnetic fields should be compressed in loops with a scale of 500-1000pc. However, no observations of the periodic pattern of loops are found. In this paper, the arm-interarm contrast in gas density and radio emission was compared to a model where a regular and isotropic random magnetic field is compressed by shocks along the spiral arms. The inner arms region, where r<1.6kpc is consistent with the model, however, the region where r>2kpc is not consistent with the model. The authors argue that it is because the random field is isotropic in the arms, but the random field becomes anisotropic due to decompression as it enters the interarm in the outer regions, which produce an increase in polarized emission in the interarm region. 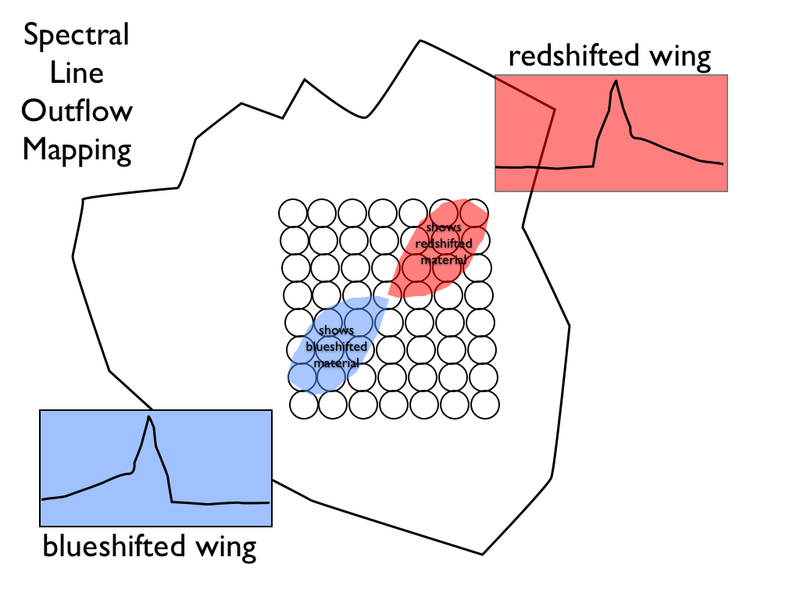 Local effects due to the magnetic field smeared along the line of sight, so that the net magnetic field is underestimated if the magnetic field were “tangled”. 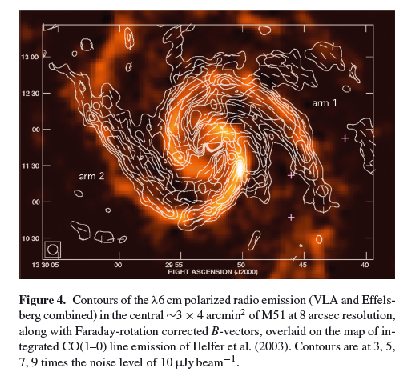 We use the COMPLETE Survey’s observations of the Perseus star-forming region to assess and intercompare the three methods used for measuring column density in molecular clouds: near-infrared (NIR) extinction mapping; thermal emission mapping in the far-IR; and mapping the intensity of CO isotopologues. Overall, the structures shown by all three tracers are morphologically similar, but important differences exist among the tracers. We find that the dust-based measures (NIR extinction and thermal emission) give similar, log-normal, distributions for the full (~20 pc scale) Perseus region, once careful calibration corrections are made. We also compare dust- and gas-based column density distributions for physically meaningful subregions of Perseus, and we find significant variations in the distributions for those (smaller, ~few pc scale) regions. Even though we have used 12CO data to estimate excitation temperatures, and we have corrected for opacity, the 13CO maps seem unable to give column distributions that consistently resemble those from dust measures. We have edited out the effects of the shell around the B-star HD 278942 from the column density distribution comparisons. In that shell’s interior and in the parts where it overlaps the molecular cloud, there appears to be a dearth of 13CO, which is likely due either to 13CO not yet having had time to form in this young structure and/or destruction of 13CO in the molecular cloud by the HD 278942’s wind and/or radiation. We conclude that the use of either dust or gas measures of column density without extreme attention to calibration (e.g., of thermal emission zero-levels) and artifacts (e.g., the shell) is more perilous than even experts might normally admit. And, the use of 13CO data to trace total column density in detail, even after proper calibration, is unavoidably limited in utility due to threshold, depletion, and opacity effects. If one’s main aim is to map column density (rather than temperature or kinematics), then dust extinction seems the best probe, up to a limiting extinction caused by a dearth of sufficient background sources. Linear fits among all three tracers’ estimates of column density are given, allowing us to quantify the inherent uncertainties in using one tracer, in comparison with the others. Molecular clouds account for half of the mass of the interstellar medium interior to the solar circle and for all current star formation. Using cloud catalogs of two CO surveys of the first quadrant, we have fitted the mass distribution of molecular clouds to a truncated power law in a similar manner as the luminosity function of OB associations in the companion paper to this work. After extrapolating from the first quadrant to the entire inner Galaxy, we find that the mass of cataloged clouds amounts to only 40% of current estimates of the total Galactic molecular mass. Following Solomon & Rivolo, we have assumed that the remaining molecular gas is in cold clouds, and we normalize the distribution accordingly. The predicted total number of clouds is then shown to be consistent with that observed in the solar neighborhood where cloud catalogs should be more complete. Within the solar circle, the cumulative form of the distribution is c(>M)=105[(Mu/M)0.6-1], where c is the number of clouds, and Mu = 6 × 106 M is the upper mass limit. The large number of clouds near the upper cutoff to the distribution indicates an underlying physical limit to cloud formation or destruction processes. The slope of the distribution corresponds to d c/dM M−1.6, implying that although numerically most clouds are of low mass, most of the molecular gas is contained within the most massive clouds. The distribution of cloud masses is then compared to the Galactic distribution of OB association luminosities to obtain statistical estimates of the number of massive stars expected in any given cloud. The likelihood of massive star formation in a cloud is determined, and it is found that the median cloud mass that contains at least one O star is ~105 M . The average star formation efficiency over the lifetime of an association is about 5% but varies by more than 2 orders of magnitude from cloud to cloud and is predicted to increase with cloud mass. O stars photoevaporate their surrounding molecular gas, and even with low rates of formation, they are the principal agents of cloud destruction. Using an improved estimate of the timescale for photoevaporation and our statistics on the expected numbers of stars per cloud, we find that 106 M giant molecular clouds (GMCs) are expected to survive for about 3 × 107 yr. Smaller clouds are disrupted, rather than photoionized, by photoevaporation. The porosity of H II regions in large GMCs is shown to be of order unity, which is consistent with self-regulation of massive star formation in GMCs. On average, 10% of the mass of a GMC is converted to stars by the time it is destroyed by photoevaporation. The kinematics of newly formed star clusters are interesting both as a probe of the state of the gas clouds from which the stars form, and because they influence planet formation, stellar mass segregation, cluster disruption, and other processes controlled in part by dynamical interactions in young clusters. However, to date there have been no attempts to use simulations of star cluster formation to investigate how the kinematics of young stars change in response to variations in the properties of their parent molecular clouds. In this Letter, we report the results of turbulent self-gravitating simulations of cluster formation in which we consider both clouds in virial balance and those undergoing global collapse. We find that stars in these simulations generally have velocity dispersions smaller than that of the gas by a factor of ∼5, independent of the dynamical state of the parent cloud, so that subvirial stellar velocity dispersions arise naturally even in virialized molecular clouds. The simulated clusters also show large-scale stellar velocity gradients of ∼0.2–2 km s−1 pc−1 and strong correlations between the centroid velocities of stars and gas, both of which are observed in young clusters. We conclude that star clusters should display subvirial velocity dispersions, large-scale velocity gradients, and strong gas–star velocity correlations regardless of whether their parent clouds are in virial balance, and, conversely, that observations of these features cannot be used to infer the dynamical state of the parent gas clouds. Why is CO an important coolant in the (very) cold ISM? Cooling mechanisms are very important for facilitating the collapse of molecular clouds, the formation of stars, and radiative equilibrium in the ISM. As discussed in class, molecular hydrogen is a poor radiator as a homonuclear molecule with no dipole moment. This means that H2 can only radiate through forbidden transitions so the rates are too low. Compared to atomic hydrogen, because molecular hydrogen doesn’t even have a 21cm analogue, cooling rates rates for H2 are lower than that for atomic Hydrogen. However as discussed in class, at high temperatures (i.e. 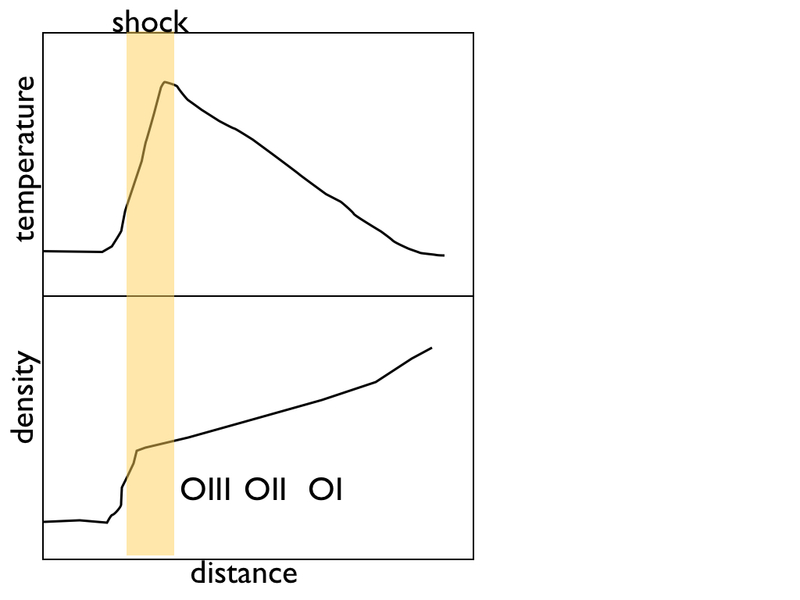 shocks) its high abundance makes H2 the dominant coolant. Consequently, heavy molecules play in important role transforming thermal energy to radiation that can escape the region through collisions (mostly with hydrogen) and various emission mechanisms. For the low temperatures of the cold ISM, the potential energy imparted to a CO molecule from an inelastic collision is only enough to excite a rotational transition. Well, it is both abundant and able to radiate from inelastic collisions at low temperatures and densities. At the most general level we might try to understand the equation by area of study. Abundances, are determined by the chemistry of the environment as various processes conspire with the temperature, densities, etc. to form molecules. The level populations, ,are covered by statistical mechanics. To calculate the transition energy, , and Einstein A coefficient, , we need to use quantum mechanics. where where is the reduced mass of the molecule and is the bond length. We’re working in the very cold ISM so we’ll assume that the CO stays in the least energetic vibrational state. Furthermore, the Carbon and Oxygen molecules in CO are connected by a triple bond with a dissociate energy of 11.2eV (1120 .) The strength of this bond means that most starlight won’t break up a CO molecule and so often CO will be the most abundant heavy molecule (Solmon & Klemperer, 1972). Furthermore, CO’s reduced mass is large compared to that of, say, molecular hydrogen. This means that transition energies for these rotational levels are small and so they can be excited at low temperatures (think tens of Kelvin). See sections 5.1.4 and 5.1.7 of Draine’s book for a nice discussion. Even with the small dipole moment of CO (0.112 Debye), optical depth effects are important. When a line is optically thick the photons just bounce from molecule to molecule and there is no net cooling effect. However, turbulence in the medium and velocity gradients will Doppler shift the photons so they may escape through the line wings. In addition, the geometry of the local medium now matters in the optically thick regime since photons emitted near to the cloud’s ‘boundary’ will be more likely to escape. In brief, the reasons that CO is such a dominant coolant in the cold ISM is because it is abundant and also because it can radiate at low densities and temperatures. But what happens when you heat the ISM just a bit? Complicating this analysis is the chemistry since the abundance of a species will depend strongly on the local conditions. Of course this complication can be useful when coupling observations and models of the chemistry (i.e. Jiminez-Serra, I et al. 2009). Abundances of molecules with Oxygen as a function of magnitude for a model of a photon dominated region that includes surface grain chemistry. Figure from Kaufman 2009. By 500 K most of gas-phase oxygen is either in H2O or CO. So in a slightly warmer environment the cooling will be dominated by water. 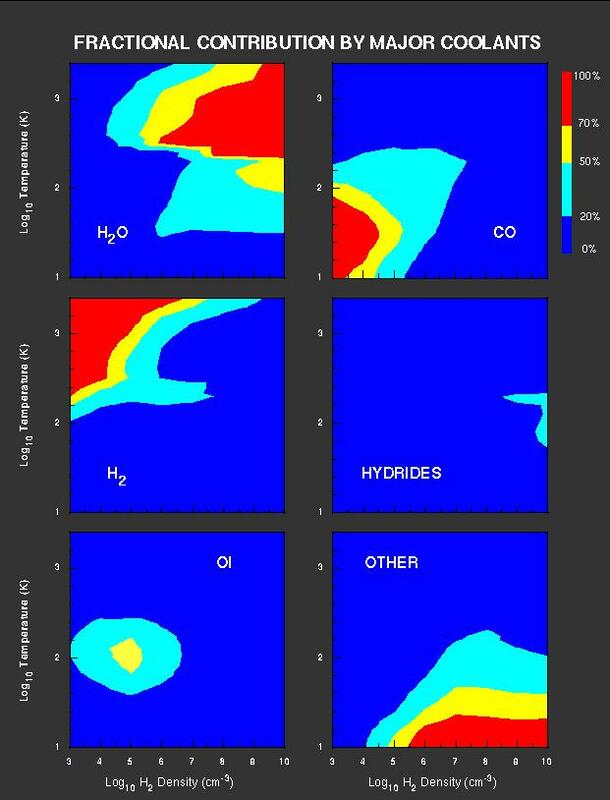 Calculations show that cooling from CO dominates in the low temperature, low density regime of molecular clouds. Another way of plotting the fractional contribution of various coolants are through contour plots over temperature and density. Effectively this calculated takes the previous figure and expands it to two dimensions. 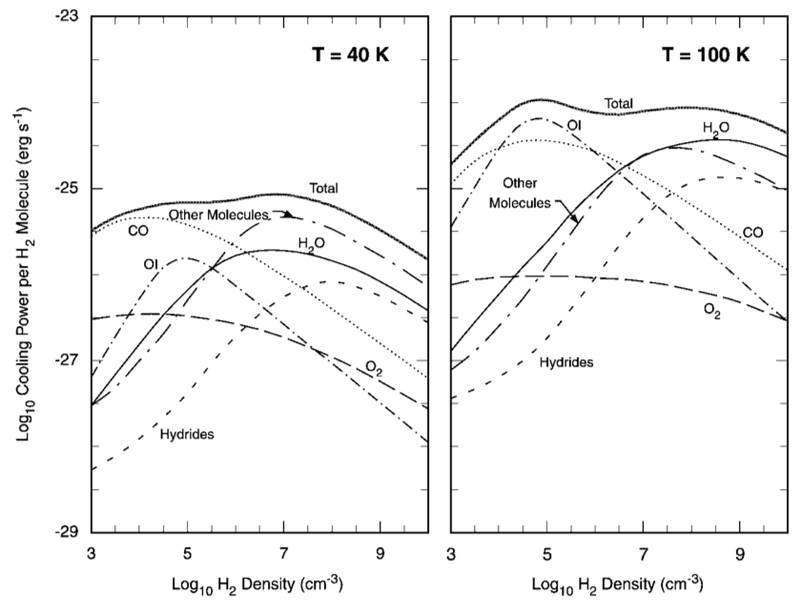 Looking at the figure below the dominance of CO in the low temperature and density regime as well as the transition to water cooling becomes apparent. Fractions of the total cooling rate from important coolants. Image from the SWASS science page, adapted from Neufeld, Lepp, and Melnick 1995. So what might this mean to me? The moral of the story is that if you are doing a calculation involving cooling or heating processes of gas, you’ll want to make sure to treat include coolants such as CO and treat the chemistry and radiative transfer correctly. That is you want the abundances and cooling rate to be right or your answers might be wrong! Some current topics include the formation of stars in low-metallicity regions (i.e. Jappsen et al. 2009) and modeling CO chemistry in Giant Molecular Clouds (i.e. Glover & Clark 2011). ESO – ALMA System Specifications. Good to have these on-hand when thinking about the molecular spectroscopy of the future! An excellent reference for Molecular Line Spectra, from NRAO. We investigate the relationships between the characteristic oxygen abundance, the radial abundance gradient, and the macroscopic properties of spiral galaxies by examining the properties of individual H II regions within those galaxies. Our observations of the line flux ratio (O II) lambda lambda 3726, 3729 + (O III) lambda lambda 4959, 5007)/H beta for 159 H II regions in 14 spiral galaxies are combined with published data to provide a sample of 39 disk galaxies for which (O II) + (O III)/H beta has been measured for at least five H II regions. We find that the characteristic gas-phase abundances and luminosities of spiral galaxies are strongly correlated. This relationship maps almost directly onto the luminosity-metallicity relationship of irregular galaxies and is also quite similar to that found for elliptical and dwarf spheroidal galaxies. Within our sample of spirals, a strong correlation between characteristic abundance and Hubble type also exists. The correlation between luminosity and Hubble type complicates the issue, but we discuss several interpretations of the correlations. The relationship between circular velocity and characteristic abundance is also discussed. We find that the slopes of the radial abundance gradients, when expressed in units of dex/isophotal radius, do not significantly correlate with either luminosity or Hubble type. However, the hypothesis that both early and very late type spirals have shallower gradients than intermediate spirals is consistent with the data. We find suggestive evidence that the presence of a bar induces a flatter gradient and also briefly discuss whether abundance gradients are exponential, as is usually assumed. We investigate the properties of individual H II regions in a subset of 42 regions for which we have spectra that cover almost the entire spectral range from 3500 to 9800 A. We use those data to estimate the densitites and ionizing spectra within the H II regions. We confirm that the ionizing spectrum hardens with increasing radius and decreasing abundance. We find no correlation between the ionization parameter and either radius or abundance, but this may be due to significant scatter introduced by the simple conversion of line ratios to ionization parameter.